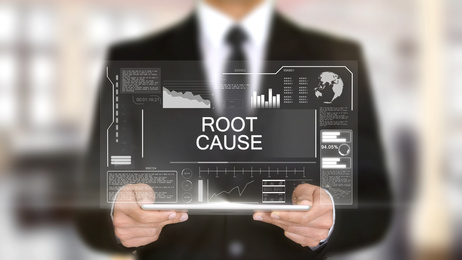 What is a Pharmacy Root Cause Analysis (RCA)? This page discusses what a pharmacy root cause analysis is, and, among other things, why it is important for technicians and other pharmacy staff to understand how helpful it can be. According to statistics, the accuracy rate of pharmacy dispensing is estimated to be 98.3% which at first seems like an enviable number compared to the accuracy rate of many other professions. However, the percentage translates to roughly 4 errors for every 250 prescriptions that are filled daily. Taken to national levels, it means that about 51.5 million errors occur for every 3 billion prescriptions. While many errors turn out to be non-issues, that still leaves many of them that cause serious complications or worse. Thus, the need to control the risk factor becomes greater for pharmacy techs to get every prescription correct as one mistake may have dire consequences. While many state have a Continuous Quality Improvement (CQI) as part of their regulatory oversight, they use Root Cause Analysis (RCA) to help them in case an error in filling out a prescription causes a serious injury or death. The RCA is a process that is used to identify the factors which caused the injury or death to occur because the prescription was mistakenly filled out. The focus is not on the performance of the individual, but rather the process and systems used that led to the mistake occurring. By identifying the root causes, it provides insight into the underlying factors that led to the unfortunate event occurring. The goal of RCA is to do a full examination of what happened, examine the current systems in place, identify the specific reason and root causes so that such an event does not occur again. The analysis itself captures the specific cause, but also the big picture in the conditions that created the environment for this to occur. For example, if the specific cause of a mistaken prescription was that the pharmacy tech was tired and misread the information, the big picture might reveal the working conditions of the pharmacy contributed to the specific cause. How is a RCA Helpful for Pharmacists? For pharmacists, the RCA is a proven system that helps get at the cause of prescription mistakes and reduces their frequency. While RCA is the standard response when a serious injury or death occurs from a mistaken prescription, it is also a system that pharmacists can use when examining their procedures to help them become more efficient and make fewer errors. Unfortunately, it has not been until the past few years that pharmacists have been able to access the tools and programs so they can conduct a Root Cause Analysis on their own to improve the overall system they use in their daily work. It allows them to step back and see the big picture of their working environment so they can work more efficiently and help avoid making errors. Being proactive helps avoid making mistakes, but that is only if the specific error can be foreseen. This is because changing a system to avoid one type of error may lead to other types of mistakes being made. RCA helps avoid that by looking at the entire system so that changes can be seen in the big picture. RCA is the tool to use when an error has occurred, whether the consequences are small or large. Until an error is made, the pharmacists should employ a system of checks and balances so they can work at peak efficiency while taking the necessary steps to avoid errors from occurring. Why do PharmTechs need to know about RCA? Pharmacy techs need to know that RCA is not designed to blame an individual for an error, but rather to find the root causes as to why the conditions in the pharmacy created the error. The environment, working conditions, and systems present create the conditions for errors to occur, which is why techs need to be as dispassionate as possible when undergoing an RCA. In most cases, the errors that led to injury or death that are focused on an individual tech were at least in part created by their working environment. Positive changes to that environment means reducing the likelihood of the error from reoccurring. There are exceptions, of course, but techs should view the RCA process in a positive light as it highlights the conditions of the workplace, not the individual. How is RCA Beneficial? & How Does It Prevent Errors? First and foremost, RCA works because it focuses on the environmental conditions of the workplace in terms of the systems, expectations, and overall atmosphere of the pharmacy itself. In the old days, the suspension or firing of a pharmacy tech because of an error rarely altered conditions in the pharmacy itself as the same systems remained in place and more errors occurred. By looking at the big picture and taking steps to correct the systems in place, the RCA brings everyone together in looking for the root causes. The type of error that caused the mistake to occur is now addressed so that its chances of reoccurring are greatly reduced. Why Does Every Tech Need to Take Medication Safety Seriously? Pharmacy techs are usually well-schooled in medication safety, but it is important to keep up the training and emphasis on safety in every prescription that is filled. While no system can eliminate all errors, instituting changes that come recommended from an RCA means lessening the chance of the same type of errors from occurring. For pharmacy techs, self-evaluation combined with a focus on the daily routine to spot potential errors in advance should be a part of their daily activities. Simple things like going too fast, feeling the pressure of getting tasks performed, and dealing with customers are all part of their everyday lives. However, nothing is more important than ensuring the prescriptions are filled out correctly and undergo a checking process so that if a mistake occurs, it is caught before it reaches the customer. The Root Cause Analysis is the step taken after an error has occurred. However, pharmacy techs (and pharmacists) have the ability to catch most potential issues beforehand by focusing on medication safety first, using the proper techniques, and following a series of procedures to maximize safety.